Home / Internet / High School Teen Stars In and#039;Wizard Of Ozand#039; – And Her Little Dog, Too! High School Teen Stars In and#039;Wizard Of Ozand#039; – And Her Little Dog, Too! 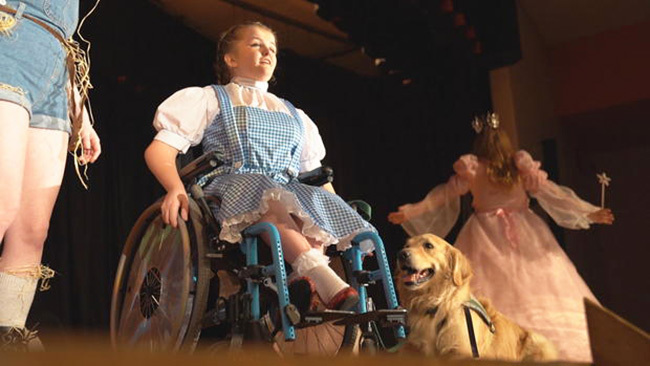 High School Teen Stars In ‘Wizard Of Oz’ – And Her Little Dog, Too! Erin is a 17-year-old student at Hasbrouck Heights High School in New Jersey. She has a genetic disorder known as brittle bond disease, and uses a wheelchair. In her 17 years, Erin has had over 100 bone fractures and 10 surgeries. Four years ago, Erin was matched with her first service dog, Gauge, a 6-year-old golden retriever. So, the school rewrote some of the play just for Gauge – since he was a little larger than the basket-fitting version of Toto. But Erin’s mom, Michelle, always saw her daughter as a star.